Which trip is the best? Which one should I choose? And which trips are your favorites? They are all great trips, but to help you decide, please click here for helpful information! What does the trip price include? Food and cooking gear plus all the cooking and food preparation, equipment (backpack/raincover & daypack, sleeping bag and pad, tent, cup/bowl/spoon), transportation from town to and from trailheads, all trip planning, all permits & fees/taxes, plus a Big Wild professional guide/naturalist and on some trips a Big Wild assistant guide, too. What if I bring my own gear? If you bring all of the items listed above in parenthesis, you get a $300 discount off the list price of the trip. What will I have to carry, and what should I bring? By definition, backpacking means you travel self-contained. You’ll carry a backpack & rain-cover with day-pack, sleeping bag & pad, cup/bowl/spoon, plus a tent or part of a tent, a portion of the group food plus your clothing and other personal items. The guide carries all of the pots and pans, first aid kit, emergency communication device and most other group items. On some trips the guide might hand out a few other light-weight items. We supply our guests with top quality gear, including modern backpacks designed for maximum comfort. Please see our backpacking Clothing/Personal Gear List for detailed information on what to bring and what to leave behind. Who can sign up, and can I go if I’m traveling on my own? Anyone who is physically fit enough for the trip can sign on. Many of our clients book scheduled trips as individuals, but we also get plenty of couples, small groups of friends or relatives, and any mix of these assemblages that you can imagine. Just be sure that you’re up for a great wilderness experience! Are there any age limits or requirements? For scheduled trips we have a somewhat flexible minimum age of 14. We make exceptions to that age rule when we are convinced that the young person can successfully do the trip and that she or he wants to do it. Other than that we have no minimum or maximum age requirement. Over the years we’ve taken folks from 6 to 76 out into the wilds! For Custom and Family Trips, each individual, group or family has its own unique set of circumstances, including age, which we are happy to discuss at any time. Do I need to bring snacks? No. We supply plenty of energy bars, trail mix, nuts, dried fruit etc. Does the trip price include pre-trip and post-trip motel accommodations? No. Does Big Wild Adventures reserve motel rooms for us? No. It is up to you to make reservations at the motel that we recommend for each trip (see Connecting and Lodging), and sooner is better than later. Be sure to tell them that you are with the Big Wild Adventures group. What do I do with the stuff I’m not taking with me on the trail? Each of our trip base motels will store your extra bags while we are in the wilderness. What do I do with the rental car that I’ll have? Each of our trip base motels will provide a place for you to park a vehicle while we are in the wilderness. Should I tip the guide/assistant after the trip? That’s up to you. We realize that some of our clients must economize and save their money for their adventures in the Big Wilds, and not everyone can afford the extra expense. However, if you feel that your guide has done a good job and you wish to express that sentiment with a tip, it is appreciated! As a suggestion, 5-10% would be appropriate. What about the timing and when should I plan to fly in and out of the area? You need to be at the motel by the night before the first day of the trip; most folks fly home the day after the trip ends. Let’s say that the advertised dates for a trip are the 5th-10th. The pre-trip safety/orientation meeting will be at 6 PM on the 4th at the recommended motel, and we’ll leave for the trail early on the morning of the 5th. We’ll return to the motel mid to late afternoon of the 10th. So you should plan to arrive for the trip on the 3rd or 4th, and to fly home on the 11th (a night flight home on the final trip day is possible, but not recommended). If possible (not required) come an extra day early — in this example that would be the 3rd. This guards against missed flight connections and gear delays; and for high altitude treks it facilitates acclimation. It’s summer; do I really need to bring a ski hat, long underwear, gloves and a warm jacket? Yes! You must bring what is on our personal gear/clothing list (and avoid extras that will weigh you down). In the Rocky Mountains (that includes Yellowstone Park) it can be cold and wet any time of year, and summer snowfall can occur! 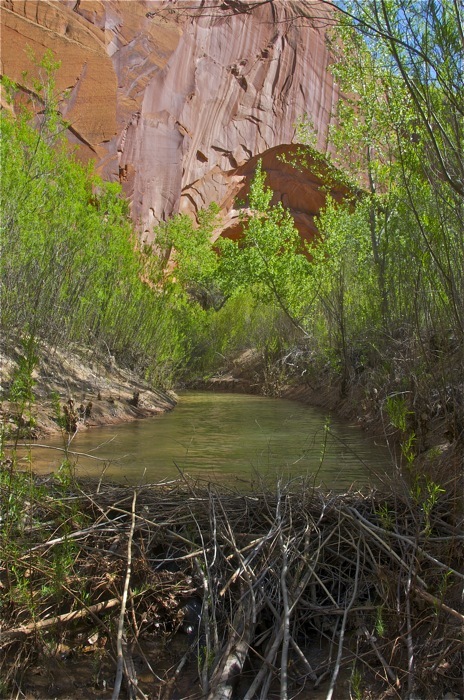 Even in high desert Utah, spring and autumn trips can also see periods of icy weather. How do we bathe and keep clean? Most trip routes include plenty of lakes and streams. Plain old water is a great cleanser, but if you must use soap or shampoo, you must rinse off at least 200 feet from any lake or stream. And be sure to immerse body parts or swim downstream (creeks/rivers) or on a distant shore section (lakes) from were we access drinking and cooking water. Will we have campfires? On most of our trips, the answer is “yes”. 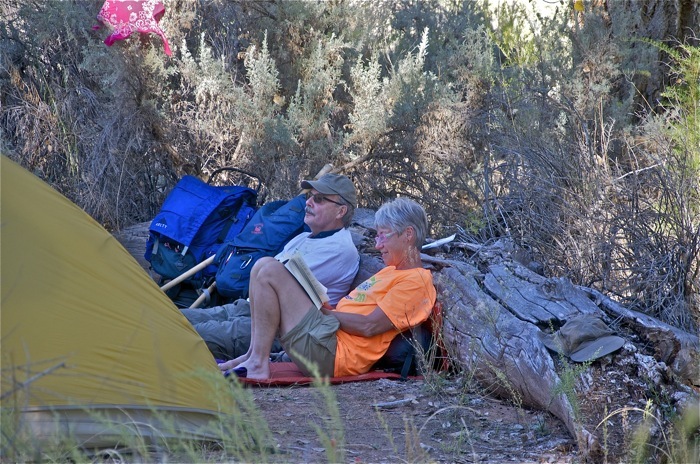 However, a relatively small percentage of Yellowstone backpacking campsites do not allow fires, and most of the desert areas on our Utah backpack trips also do not allow fires. 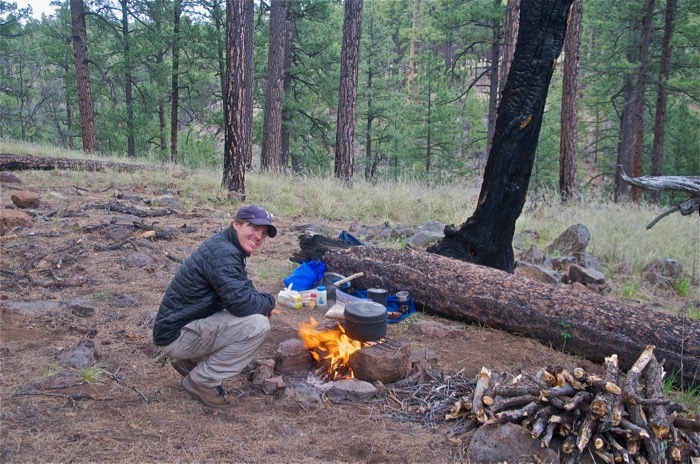 Of course, conditions vary, and in any of our trip areas prolonged periods of dry weather may result in temporary campfire bans, in which case we’ll be cooking on stoves (we supply them) as we often do on our desert trips. Do I need to purify the water? That’s up to you. 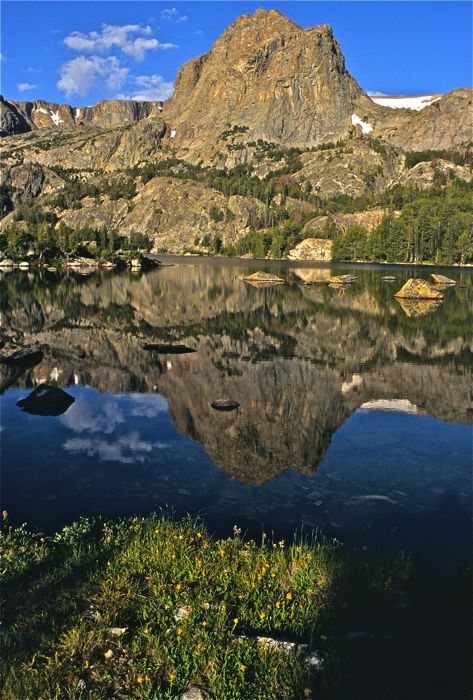 We recommend it for trips in the Southwestern U.S., but on treks in the northern Rockies and Alaska, our guides and many of our clients drink right from the creeks or lakes with no ill effects. If it gives you peace of mind, by all means purify. Iodine tablets are the lightest weight, and the neutralizer tablets (simple vitamin C) remove the iodine taste. Filters and UV purifiers also work. If I’m using Big Wild equipment, will I have to share a tent with somebody I don’t know? No. You will get a one person tent for yourself. If you come on the trip with a friend or relative, we’ll probably team you up with that person unless you request a single tent. How can people contact us while we are on the trip? Generally speaking, they can’t. You’ll be in the wilderness, and that is one of the attractions. Know that your guide carries either a cell or sat phone for life-threatening emergencies on the trip. We recommend against our clients carrying such devices, but in extreme cases where a guest expects an important communication, we won’t absolutely forbid their carrying such a device so long as their use of it is subtle and non-disruptive. How do we poop in the woods? Some national park backcountry camps have outdoor privies. But mostly, we dig individual “cat-holes” in the ground at least 6″ deep and at least 200 feet from water (we provide a trowel for digging), and we thoroughly bury our waste and paper in the hole. 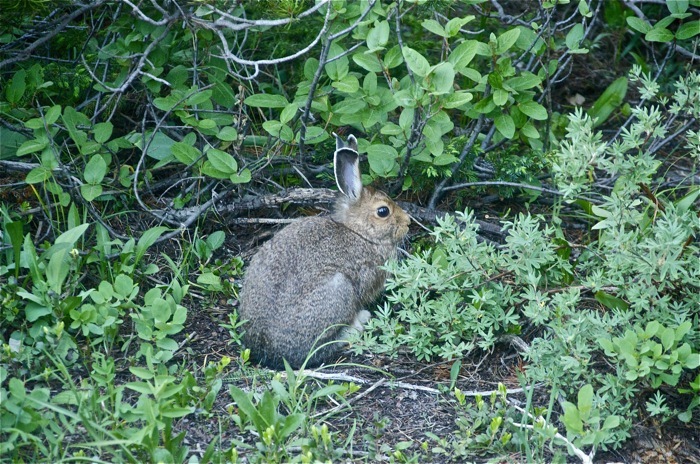 We naturalize the site and nature does the rest. This is simple, easy and much more sanitary than any public restroom! Please wash and use hand sanitizer afterwards. In desert, alpine or Arctic environments, your guide may modify these instructions. Read more. What about bears? We are experts in bear country and our safety record is perfect. Driving to the trailhead, falling and drowning are statistically much greater dangers than bears. Nonetheless, when backpacking in Yellowstone or backpacking in Montana or backpacking in Wyoming, we may — if we are lucky — see a bear or two. Same goes for our Arctic National Wildlife Refuge treks in Alaska. And there are black bears that we might be lucky enough to see while backpacking in Colorado, though it is unlikely that we’ll see bears in the canyon country while backpacking in Utah. Wherever the trip, be assured that we engage is safe behavior around bears, with practiced expertise that’s second to none. For more information, please see Bears in the Big Wilds. I’m going to buy my own gear. What size backpack should I get and what should my sleeping bag be rated to? For treks of 4-5 days or longer, an average-sized man should have a pack of at least 5,000 cubic inches (about 80 liters), and an average-sized woman at least 4,000 (about 65 liters). For June through September trips in the Rocky Mountains and indeed for most of the treks we run, get a bag that’s rated to 20 degrees F or lower. That’s because most sleeping bag ratings are optimistic, and in the high country it may get well-below freezing any night of the year. A mummy bag is the most efficient from the standpoint of weight and packing. For a given warmth rating, down is lighter and more compact than synthetic, but it’s also more expensive and you must be careful to keep it dry. How much will my pack weigh? At the beginning of a 6-day trip, an average-sized man’s pack will weigh 40-45 pounds if he carefully follows our clothing/personal gear list; an average woman will start off around 35 or so pounds. By the end of the week packs will be 7-10 pounds lighter because we will have eaten the food. What size group will I be in? On Custom & Family Trips, it’s your private experience, so it’s up to you and your group. For some scheduled trips, there is a 10 person limit including guides; other routes have total group size limits that range from 5-8. Typically, expect 4-7 people including staff. 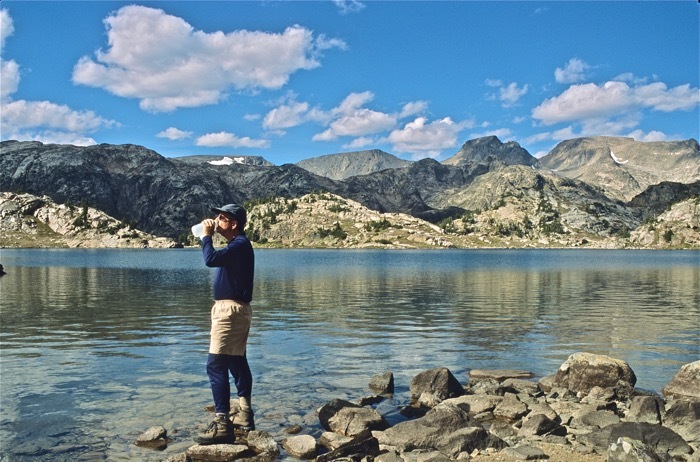 In our home region of Montana and Wyoming, including Yellowstone backpacking, we will run a trip even if just one person signs up — which is rare, but it occasionally happens. Once we confirm that you are booked on the trip, we will not cancel your vacation plans!